This little trick to show calendar events as a list should work on all versions of the Mac Calendar app. * Note: You can also search for two concurrent quotations like “” if desired, but searching for a single period like . is probably easier for most Mac users. Try both and see what works best for you. 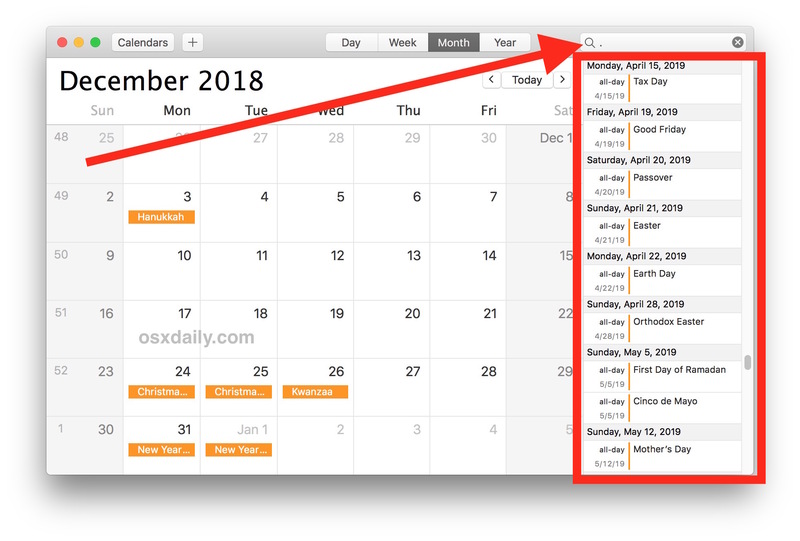 So, you want to see a Calendar event list on the Mac? Then search for a period. Or search for a series of two quotation marks like “” That’s it! Simple, if not quite obvious. Thank you for the List view in Calendar. I am going to find it very helpful. It works BUT it fails to show MANY calendar meetings on several days ( including today) they are all on the same calendar so that is not the cause. Tried several times on iMac 2012 version running newest High Sierra OS. Me, too. Not all events show up. I found a similar problem when using . but “”” worked fine. OMG. I’ve been looking for something like this. TY TY TY. Fantastic. I’ve spent hours ticking and unticking calendars, and this is just what it needed. Helpful – kinda. why do I want to see bak to 2015? How about a way of viewing a month – qtr, 1/2 yr? Apple’s programmers on their Calendar have really created and provided us a simple basic day to day calendar and no where near the commercial third party calender’s. I do not even use Apple’s Calendar. Are you confusing parentheses with quotes? Nope, latest OS, MacPro 2012, all I see is a big nothing, changing views to days, weeks, months, years made no difference.. I had Shared it to our MUG, took it down! When I tried your suggestion, searching for a period only returned results for some calendar events. However, searching for “” returned results for what appears to be all of my events. So am happy for this suggestion, but recommend folks not rely on a period as the search parameter. Amazing, I have been wanting this function forever and now I have it. Like I said, amazing. The period doesn’t work with all events, unless you always insert at least a mail, a website (both have dots within) or some period in the notes or the title. Better to use “”, which provides the complete list! This doesn’t work. There are several items in my calendar that do not show in the search results, but appear in the calendar being searched. I have a MAC WITH 10.13.3 VERSION. I keep receiving the message, “This web page was reloaded because a problem occurred” when I open some web pages. I have not been able to find a way to correct this. Any suggestions? The Safari problem you encounter is not related to showing a Calendar list on a Mac. The Calendar app should not impact Safari or any web page at all. – Backup your Mac and install any available software updates to Safari and the MacOS system. What you are encountering is a crashing webpage, but sometimes it’s the browsers fault (Safari). You also might want to disable all extensions and third party plugins, since those are often prone to cause problems in a web browser. You could also use Chrome or another browser. As for calendar, don’t worry it is not the source of your web page crash issues, it is Safari. This doesn’t work anymore. Now it only picks up events with periods. Maybe it changed with Mojave.